We stock a select group of Park and Slow flyers. These are some of the best electric planes in their category. They include the terrific Hobby Zone Firebird Xl Park Flyer, The Tiger Moth Bi-Plane that was recently featured on Back Yard Flyer's magazines front cover "10 best Park & Home Flyers", and the wonderful Pico Stick/Pico Stick FD Slow Flyer. *New arrival:Gws Zero Fighter see below. GWS Sub micro flight pack. 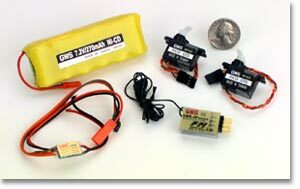 Includes a 4-channel micro receiver, 2 Naro or Pico servos, a 2-amp speed control, and a 270mAh 7.2V battery.